"Jay Cutler really isn't to blame for the Bears' recent swoon. This season, for the first time in his career, Cutler is averaging at least two touchdown passes for every interception thrown." "All the promise of three weeks ago has crumbled, with successive losses to the 49ers, Redskins and Vikings. Each defeat has gotten progressively worse, congruent with the increased quality of the opponent. The trend also reflects the notion that the Bears were succeeding with smoke and mirrors, making big plays at the end of games that could've gone either way. While Jay Cutler might be the poster child for the losing, the pass defense has done more harm than the passer over the past three weeks. First, there was Blaine Gabbert's home run ball to Torrey Smith. Then Kirk Cousins put on his best road performance (and earned his only road win) of the season. This past Sunday, Teddy Bridgewater fell a few pitches short of a perfect game with a 154.4 passer rating. This just in: Gabbert, Cousins and Bridgewater are not exactly a murderer's row of QBs." 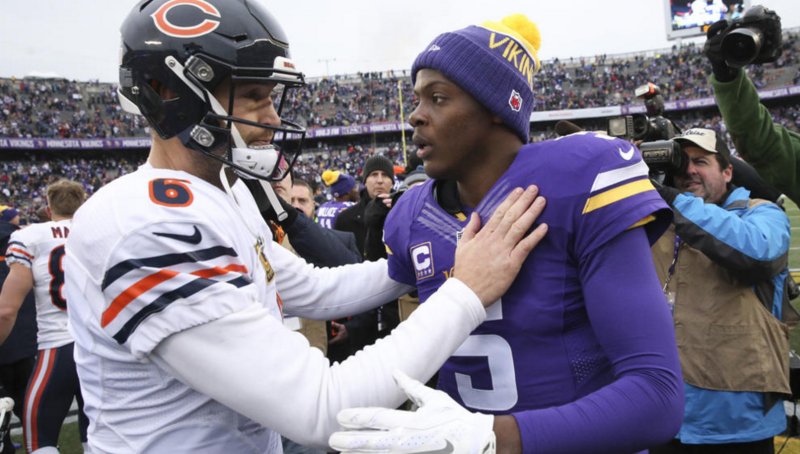 "The Bears have hung around all season for the most part, but in Week 15 they allowed opposing QB Teddy Bridgewater to throw for more touchdown passes (four) than incomplete passes (three)." "The Vikings had some huge defensive injuries, and still the Bears did nothing. That four-week stretch in which the Bears looked like a good team seems like it never happened." "The bear that mauls Leonardo DiCaprio was way scarier." "We wouldn't blame free-agents-to-be Matt Forte and Alshon Jeffery if they wanted to shut it down these last two weeks." "After a nice midseason, they've fallen on hard times. They just don't have the talent."